including examples with porphyry bases similar to these candelabra in the James A. de Rothschild Collection at Waddesdon Manor, the Victoria and Albert Museum and the Louvre. G. de Bellaigue points out that the model probably post-dates 1785, as the waistcoat with flared ends was replaced in 1786 with a waistcoat with straight edge of the type that the boy is wearing. 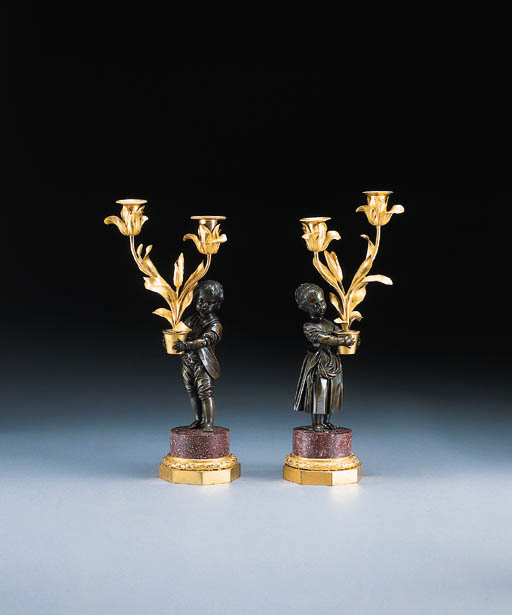 A pair of candelabra sold from the stock of the ébéniste Jean Goyer in 1789 and described as 'Girandoles... a enfant portant des Tulippes...' may be of the same model (see G. de Bellaigue, The James A. de Rothschild Collection at Waddesdon Manor, Furniture, Clocks and Gilt Bronzes, London, 1974, vol.II, pp.710-712, cat.176).